Margot Strauhull discovered yoga in 2003, after years of classical ballet training, and found the opportunity to practice movement without judgement or comparison refreshing and it ignited her journey into studying yoga. She completed her 200 hour RYT certification through Nosara Yoga Institute in Costa Rica in 2006. As a licensed clinical social worker, Margot is attentive to the intersection between yoga and social work and works to create space in her classes for the healing power of a mindful practice. Since 2010, she has enjoyed volunteer teaching with Living Yoga, bringing yoga to vulnerable individuals in our community. 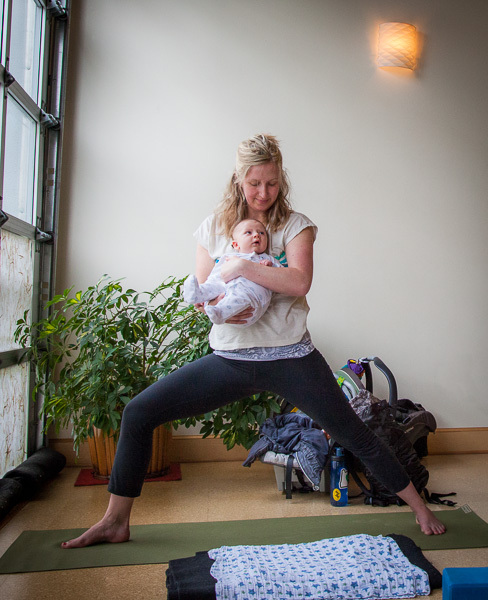 In 2014, Margot completed her prenatal yoga teacher training through The Bhaktishop in Portland, Oregon. As a mama herself, Margot is honored to offer prenatal yoga classes that provide a supportive and inclusive environment for individuals at all stages of pregnancy. In addition to teaching yoga, Margot is also an instructor for the Yoga Way to Birth, a mindfulness based childbirth education program, founded by Tina Lilly. Margot is grateful to all the teachers she has studied with throughout the years, including Don and Amba Stapleton, the teachers of Unfold Yoga and the Samarya Center and Shana Celnicker-Chong and Tina Lilly. When not teaching or practicing yoga or working as a social worker, Margot can be found soaking up time with her family, including her loving husband, three darling boys and their gregarious pup and enjoying her native city of Portland. Margot meets the qualifications for both E-RYT 200 and RPYT through the Yoga Alliance.